Two countries were also progressing towards establishing India-Saudi Arabia 'Strategic Partnership Council', says Modi. 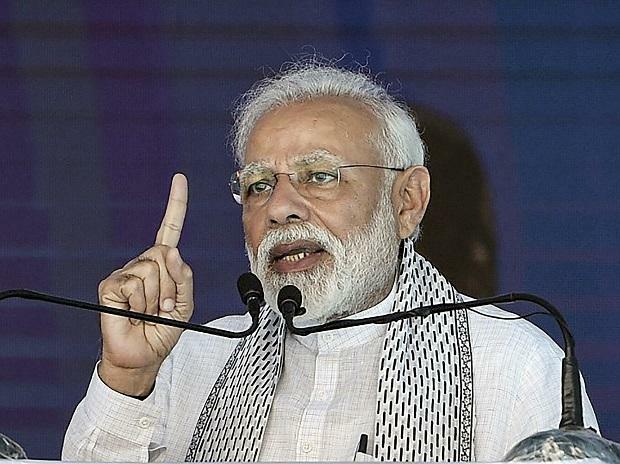 Prime Minister Narendra Modi has said India was a victim of terrorism "sheltered and supported" from across the border, as he demanded that all nations reject the use of terrorism against others, dismantle the terror infrastructure and stop its financing. In an interview published in Wednesday's editions of Arabic-language newspaper 'Okaz' and the English newspaper 'Saudi Gazette', Modi said India strongly condemns extremism and terrorism in all its forms and manifestations. The interview coincided with the maiden state visit of Saudi Crown Prince Mohammed bin Salman to India, days after the Pulwama terror attack carried out by Pakistan-based Jaish-e-Mohammed terror group. The attack, one of the worst in Jammu and Kashmir, killed 40 CRPF soldiers. "India has been a victim of terrorism sheltered and supported from across the border for over decades, claiming thousands of innocent lives," said Modi, without mentioning Pakistan, a close ally of Saudi Arabia, by name. Modi said the menace of extremism and terrorism threatens all nations and societies, and reject any attempt to link this universal phenomenon to any particular race, religion or culture. "We also call on all states to reject the use of terrorism against other countries; dismantle terrorist infrastructures and stop its financing," he said, adding that India strongly condemns extremism and terrorism in all its forms and manifestations, regardless of its motivations whenever, wherever and by whosoever committed. The two countries have close cooperation on a range of security issues, particularly on maritime security, law enforcement, anti-money laundering, drug trafficking, human trafficking, illegal migration and other transnational organised crimes. To further enhance our bilateral cooperation in the counter-terrorism efforts, the two countries could initiate comprehensive security dialogue mechanism at the level of the National Security Advisors who will interact at regular intervals, the prime minister suggested. "We also share the vision of peace and security in the Indian Ocean region," Modi said on the need to ensure safety and security of sea-lanes of communications, safety and freedom of navigation in the shipping lanes and trade routes. "We attach high priority to our friendly relations with the Kingdom of Saudi Arabia." He said the traditionally close ties are anchored in the shared interests based on centuries-old economic and socio-cultural ties and vibrant people-to-people contacts. "Our leadership has been working closely with the Saudi leadership towards further deepening our multifaceted ties for the common benefit of our two countries. The political commitment at the leadership level has been reflected by the fact that India has been identified as one of the eight strategic partners by Saudi Arabia," he said. Modi noted that the two countries were also progressing towards establishing the India–Saudi Arabia 'Strategic Partnership Council' which focuses on consolidating bilateral cooperation in specific areas under the Kingdom's newly constituted Saudi Centre for International Strategic Partnership (SCISP). "India and Saudi Arabia ties will be a factor for stability, peace and security in our region and the world," he said. India and Saudi Arabia have been holding energy consultations for past few years to explore the joint investment opportunities and cooperation between the two countries and also to encourage the Saudi private sector companies to invest in oil and gas sectors in India. "We welcome the Saudi Aramco's committed 50 per cent partnership in the USD 44 billion Ratnagiri Refinery project as an enhancing factor to our strategic partnership. We also welcome the interest of the Saudi Basic Industries Corp to invest in India," he said. "During my visit to Riyadh in 2016, the two countries concluded the Framework Cooperation Agreement between Saudi Arabian General Investment Authority (SAGIA) and Invest India. We welcome greater investment of Saudi Arabia in our infrastructure and other areas including NIIF (National Investment and Infrastructure Fund, India's first sovereign wealth fund)," Modi said.